Ecover jumps the wave - high speed sailing under spinaker. Nick Moloney`s Skandia, always pushing, pushing, pushing ! 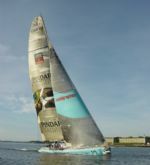 Britain’s veteran solo sailor Mike Golding has brought his Owen Clarke designed Open 60 Ecover into first place in the 2004 Transat Race in a time of 12d 15h and 18m. Golding shattered the existing transatlantic solo record by more than two days in the most impressive performance of his solo career. Dominique Wavre followed him three hours later on Temenos and then by kiwi Mike Sanderson on his Owen Clarke 60, Pindar. Sanderson’s podium place is an impressive performance for this hugely experienced Volvo and AC sailor. This was his first solo race and as this hugely self deprecating skipper admitted on the dock to an amazed audience, the first time he’d had to navigate for himself! Some time this evening if all goes well Nick Moloney and Skandia will cross the finish line here in Boston in fourth place capping an amazing 24 hours for this ‘young’ design office. Skandia four years ago was Ellen MacArthur’s Kingfisher which she too sailed into an incredible first place in the same race, before going on to come second in the Vendee Globe. Kingfisher as she was then was designed by the design team of Owen Clarke Design/Rob Humphreys and built by Marten Yachts in Auckland. Significantly both the Kingfisher and Ecover campaigns also benefited from a project management package provided by Owen Clarke Design through the concept, design, construction and early sailing life of the yachts. Much congratulations and praise have been heaped on all those involved in these boats who are present on the dock here in Boston. Meanwhile, Ecover and Pindar’s lead designer Merfyn Owen was at pains to remind everyone of the real importance of team effort in just getting one of these ‘solo’ boats to the finish in a race such as this. Yet again the Transat has seen some significant retirements in conditions that have seen the boats pushed to their limits. Conditions that during the press debrief Mike Golding indicated he’d not seen on the last Vendee and demanded a degree of lady luck to get through unscathed. The performance of the Owen Clarke 60’s as well as being very much in the hands of their skilled skippers is no little influenced by those who have worked behind the scenes. Their respective shore teams and suppliers such as North Sails figure highly here. One other common denominator of all three of Owen Clarke campaigns has been the composite engineering of the yachts by British based consultants SP Technologies, who Owen sights as a significant factor in the relatively trouble free passage in what has been a very tough race. Other’s not represented here in the early hours of the morning are Rob Humphreys who’s roll in the design of Skandia is pivotal to both that boat’s success but also influenced the design of Pindar and provided part of the background and springboard for Owen Clarke to push the frontiers of swing keel racing yachts further with their Open 60 design Ecover. Finally, nearly always forgotten but never last in the mind of the designers are the builders and mast makers who take on the job of making the concepts work and bringing them to reality. In this year’s Transat, boats one and three were both built by the highly skilled and enthusiastic guys at Southern Ocean Marine with masts from another great New Zealand supplier, Southern Spars. Thanks to everyone and especially the skippers for having us along and making us look so flash. Enjoy tonight everyone, you all deserve it ! Owen Clarke Design Footnote: Meanwhile out on the race-course, the latest poll has US sailor Kip Stone on his Owen Clarke designed Open 50 Artforms leading his class by 213 miles, with 408 miles to go. Artforms is expected to arrive some time on Tuesday and has a chance of breaking the current Open 50 record set by Giovanni Soldini in 1992.